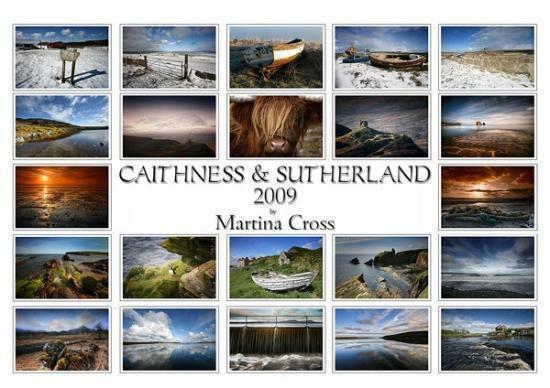 The Caithness And Sutherland calendars from Martina Cross produced for 2007 and 2008 were sold out almost immediately. It was hardly surprising to anyone who has seen her work on her own web site and many examples on Caithness.org. Through a unique blend of photography and artistic flair Martina manages to capture the essence of places in the far north. The 2009 calendar is no exception with beautiful views that scream out from no less than 72 photographs - 12 main pictures and five smaller ones for each month of the year. But don't leave it too late as a limited print run means there are always going to be disappointed people each year. The calendar has been sent all over the world in the past two years for ex-Caithnessians and others wanting some special views on their walls. You can order the 2009 Caithness and Sutherland calendar from Martina's web site. Martina Cross 2008 Caithness & Sutherland Calendar is the best yet. Martina Cross had a sell out of her 2007 Caithness & Sutherland Calendar so if you want one for yourself or as a present get your order in soon. Update on Sell-out Calendar The Calendar has been an instant success and all copies are now sold. Martina promises to start earlier next year and come back with a larger print run.